← Do You Ever Worry About Your Reading Future? Synopsis from Goodreads: In a land without magic, where the king rules with an iron hand, an assassin is summoned to the castle. She comes not to kill the king, but to win her freedom. If she defeats twenty-three killers, thieves, and warriors in a competition, she is released from prison to serve as the king’s champion. Her name is Celaena Sardothien. Why did I wait so long to start this series? Once again, I was missing out on a FANTASTIC series all because I didn’t feel like listening to recommendations from other bloggers. Maybe a mixture of both? 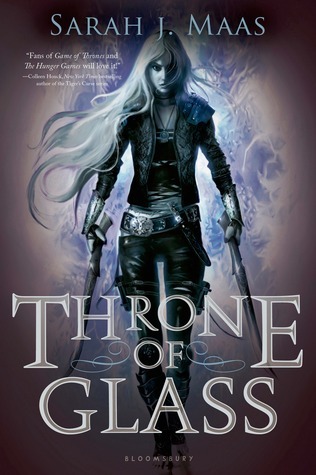 Throne of Glass has accomplished three things for me: 1) I’m reminded of just how much I truly love high fantasy. 2) I found a new favorite series that I’ll be reading over and over again. 3) Sarah J. Maas is now an auto-buy author for me. There really is not much I can complain about for this book, so enjoy the next few paragraphs of my fangirling! The best part of Throne of Glass for me was Celaena – she was this badass, don’t mess with me kind of chick that completely dominated the page, even when she was weak after being in the mines. I think the greatest part of her personality is that she embraces her femininity. She likes to wear nice clothes and have her hair done, and knows how to use her beauty to get what she wants. And when it’s time to be an assassin, she buckles down and does what she needs to do. And when she’s presented with not one, but TWO possible suitors, what does Celaena do? Stays an independent and rational woman who knows her priorities. The mystery and suspense and mystical demons had my heart racing – and there were some points where I had the goosebumps from how creepy it all was. SO well done, especially since I’m not scared easily. Basically, Throne of Glass had it all. Politics, court life, ball gowns, princes, magic, deception, romance, sabotage – the list goes on! It was like I had written a list for Santa and Maas was my own personal writing elf. I know this review is super short compared to my usual but I really am speechless at how flawless this book is! Oh man, now I wish that I didn’t wait so long to read this one too – i need to add this in now! Celaena sounds absolutely awesome! Now that’s the kind of female lead you want to read about. READ IT AND YOU WILL REALIZE HOW SPECIAL HE IS!!! OMG CROWN OF MIDNIGHT WAS EVEN BETTER!!! I had the same reaction as you! Why had I waited so long!? I loved Celaena so much. Like you, I really liked that although she was an assassin trained to kill, she still embraced ‘superficial’ things like pretty dresses and having her hair done. I read some reviews that viewed that as a positive but for me, Celaena showed that you can be typically feminine and still be strong, and that’s something we girls should embrace.